Custom Football Fans Wedding Cake Topper - BobbleGram Inc.
Oh, I have a feeling this is going to be a popular one, Ladies and Gentleman! This adorable design features the bride and groom in custom football jersey. She is a HUGE Philadelphia Eagles fan and her adoring groom is a Giant New York Giants fan. 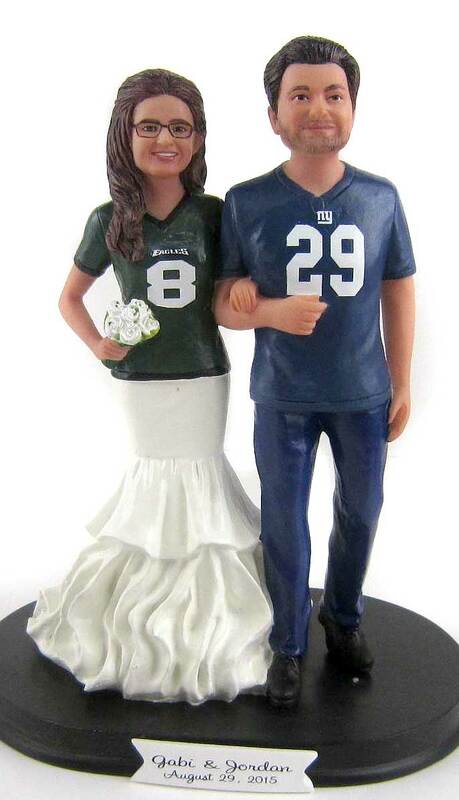 The result is this customized football fan wedding cake topper. We hand sculpt the faces and hairstyles based on your submitted photos. We will custom paint the jerseys any colors you like and add your wedding date and last name. How romantic!